As of July 2007, eight "Benjamin's Bugs" have been released. Our hope, of course, is that Ben will continue to adventure on vicariously through these inanimate objects. So, where are they now? Read on to track his progress. Intrepid Insect #863, a grasshopper, was placed by Four Generations of "Benjamin's Bugs" into the Clark Box cache in Patagonia, AZ, along the AZ Trail. From there, it traveled to Forest Lake, MN, then to Anchorage, AK. Currently, it's enjoying cool temperatures in Butte, AK. Intrepid Insect #368, a black ant, was released in Tubac, AZ, along the historic Anza Trail. It was found and carefully transported by a family with two boys to Lake Mono, CA, where it remains at present. They wrote, "We were on our way home from an Easter Vacation in Arizona. My wife and boys were very touched by this bug. We said a prayer for your family as we sent the bug on its way." Our sincerest thanks! 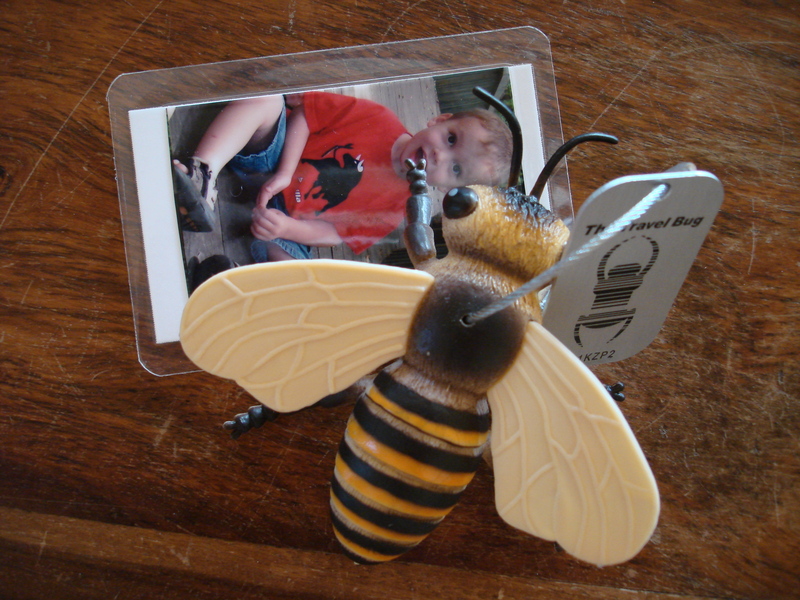 Recently, this bug was collected by a travel agent from Australia, who has taken it with her to New South Wales -- woohoo, Ben would be so thrilled! Waiting to see where it goes next! 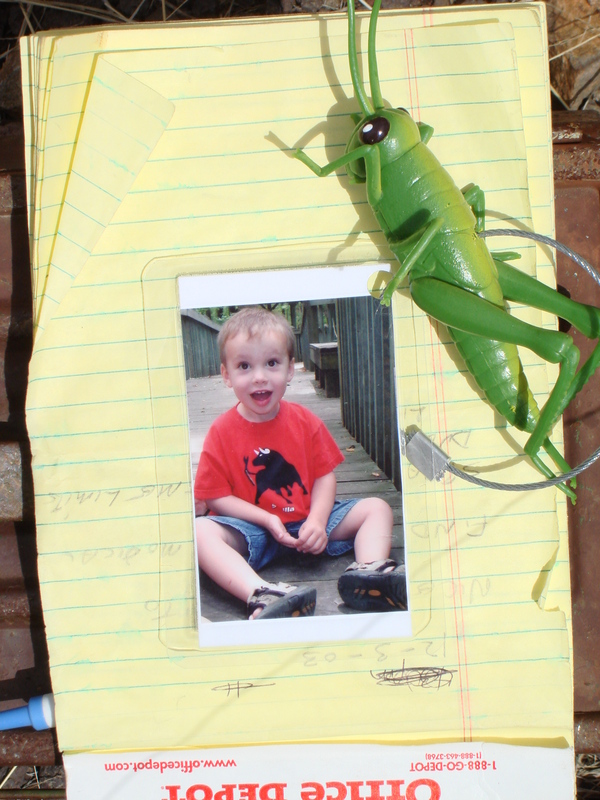 Rambling Reptile #51**** was placed in the "Dad and Son" tribute cache on Mt. Lemmon in Tucson, AZ. 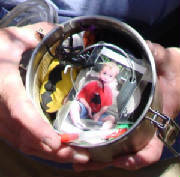 This cache was close to our hearts, as the son memorialized died of cancer at age 22. The bug was moved down the mountain to Windy Point, then to Phoenix, AZ, and now is on its way to MI. Meandering Mollusk #9T****, a brown snail, was placed for us by our devoted neighbors and fellow geocachers, Team DLTCT, in San Diego, CA, in a travel bug motel with prime Mission Bay views. While seeking the cache, Team DLTCT came upon a live meandering mollusk, and photographed the meeting of the two -- see photo. Thanks Team DLTCT! MM then was traveling companion to busy geocachers, Team Polecat, who showed him a good time in the bay area! He visited Indio, CA, then Lake Gregory, CA. Presently, MM is waiting with Polecat's travelbug and new buddy, Terrible Lizard, to move via wormhole to the UK. Intrepid Insect #86, a praying mantis, was released in May 2007 into the Sunset Cache in Springerville, AZ, on an insanely blustery day. Placement was in commemoration of our first camping trip without Ben -- as always, he was sadly missed but lovingly remembered. Promptly, the mantis was discovered and moved to Hatch, NM. From there, he traveled with adventurous geocachers to Deming, NM, Rocky Mts west of Denver, Cheyenne, WY, Bismarck, ND, and rested in Duluth, MN before being moved to Bemidji, MN. Now it has been placed in Valley Springs, CA. Intrepid Insect #A1----, a Bumble Bee, was placed in Richmond, VA by the Creek Crossing Coots, at their annual Richmond Rally. The Coots wrote, "It is an honor to start Benjamin's bug on its travels here in Richmond. I'm sure with the active cachers here in the Central VA area, this bug will see many sights." Thanks, Coots! From there he spent some time in our nation's capital, then ventured down to Fairfax, VA, where he awaits his next adventure. Intrepid Insect #YF----, a Black Ant, was released in Vancouver, Canada by WolfWild. It was promptly picked up and moved to Nova Scotia. 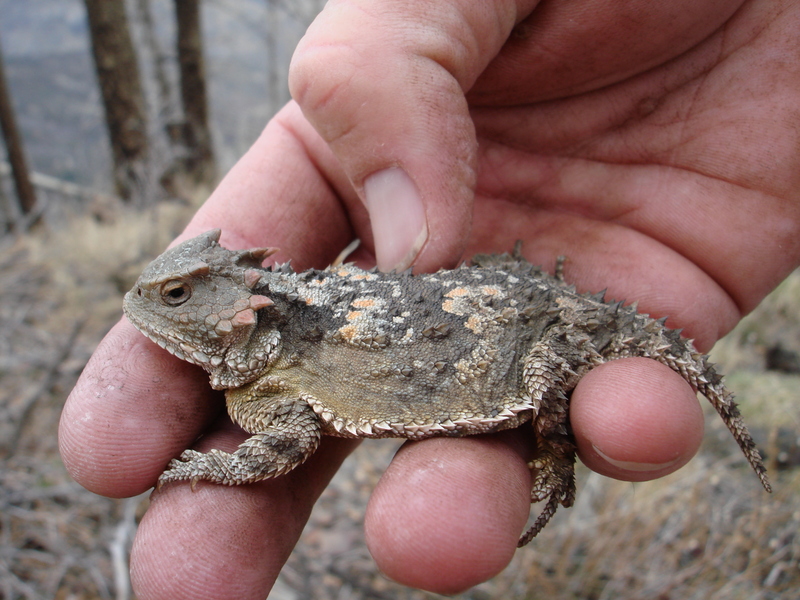 Rambling Reptile #X7----, a Green Spiny Lizard, was taken on Carnival Spirit cruise ship by WolfWild to Anchorage, AK. Before setting foot on land, Green Spiny ate, drank, was merry, and was taken by the cruise activities director to meet the ship captain on the bridge. Once he had his land legs under him, he was handed off to enthusiastic geocacher li1gray, to see some local AK sights.